All longer courses are open to anyone who has previously worked with Didier and is ready for more intensive training. These courses are by invitation only. All residential courses are held at Casa Saraswati, our retreat centre in Tenerife. 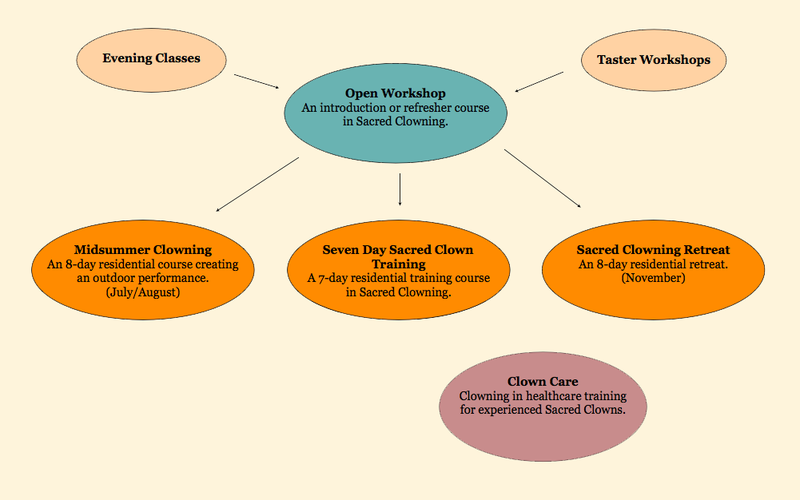 Complete in themselves, the three courses constitute a basic one-year training in Sacred Clowning and are essential for further professional training, for example clowning in healthcare. Places are limited and by invitation only. Please see our Programme 2012 for details of dates and venues, and contact us here for further information. The focus of this 7-day course is to practice and sharpen your existing skills as a Sacred Clown, with the aim of developing areas which you find difficult or haven't yet integrated. Didier will give specific directions and guidance to each individual to support the emergence of your unique Sacred Clown. Click here to see an article and pictures of our last training. During this 8-day residential course you will explore your Sacred Clown in the context of outdoor performance. Creative forms will emerge out of our group explorations and the beautiful nature in and around Casa Saraswati. Through mime-clowning, dance, singing and live music we will devise a performance that unites creativity, visual poetry and the joy of interdependence. The shared performance will be in full make-up and costume at Casa Saraswati for an invited audience. Booking for Summer 2012 is now open, see here for more details. You can also watch a video of our last Midsummer Clowning residential. This 8-day retreat will focus on strengthening the spiritual ground and on developing the artistic skills of the Sacred Clown in harmony with our heart´s aspirations. We will sharpen our awareness in relation to creative improvisation. The pace and content of the course will shape itself around the needs of the participants. Click here to see an article and pictures of our last training. You can also hear audio of mantras recorded from our last November retreat. This course will focus on indoor stage performance, with a spiritual view. It will be offered to more experienced students. If you are interested, please let us know by emailing info@teatro-del-corazon.org or by using the contact form here.